FEMA CAMPS ARE REEDUCATION CENTERS. The FEMA camps all have railroad facilities as well as roads leading to and from the detention facilities. Many CAMPS also have an airport nearby. The majority of the camps can house a population of 20,000 prisoners. Currently, the largest of these facilities is just outside of Fairbanks, Alaska. The Alaskan facility is a massive mental health facility and can hold approximately 2 million people. allows the Federal Emergency Preparedness Agency to develop plans to establish control over the mechanisms of production and distribution, of energy sources, wages, salaries, credit and the flow of money in U.S. financial institution in any undefined national emergency. 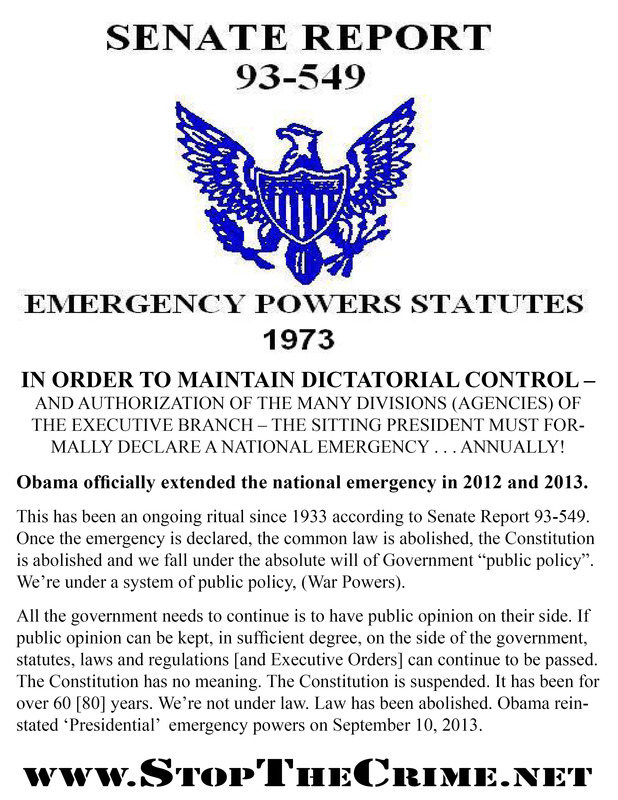 It also provides that when a state of emergency is declared by the President, Congress cannot review the action for six months. The Federal Emergency Management Agency has broad powers in every aspect of the nation. General Frank Salzedo, chief of FEMA’s Civil Security Division stated in a 1983 conference that the saw FEMA’s role as a “new frontier in the protection of individual and governmental leaders from assassination, and of civil and military installations from sabotage and/or attack, as well as prevention of dissident groups from gaining access to U.S. opinion, or a global audience in times of crisis.” FEMA’s powers were consolidated by President Carter to incorporate the . . .
(A) Declare and record your correct nationality and political status and (B) Organize your local and State Jural Assemblies and (C) Elect your own Justices, Court Officers, and Sheriffs to enforce the Public Law, and (D) Otherwise, we mind our own business and let the Federales take out their own dirty laundry. The step-by-step restoration of our lawful government may sound boring to those who crave drama, but it is peaceful and orderly and gives the Vermin no excuse to interfere with us and our affairs. Those who rampaging around like bulls calling for “war” of any kind are playing into the hands of the thieves and murderers responsible for this whole situation. Be gentle as doves and wise as serpents. If you are an American, all the nastiness taking place in DC, all the criminal actions and bankruptcies and drama — all that has nothing to do with you. That is all the business of your subcontractors, the “U.S. Citizens”. It’s their mess. Leave them to clean it up, while you clean up your side of the fence. Imagine that you are the Lord of the Manor (because you are) and you are looking out your window. You see your Lawn Care Company employees and your Waste Management Company employees duking it out on the front lawn. Both companies are in receivership and its a real donnybrook melee. Does that have anything to do with you? No. Send their bankruptcy trustees a bill for damaging your grass and move on. You have your own business to attend to. Keep your pert noses out of the Federales’ fights and address your own affairs. Many of the “LEOs” — Law Enforcement Officers — have been blackmailed and more have been betrayed by leaders and fraternity brothers they trusted. It’s not a pretty situation. Many of them are still ignorant and have no idea that what they are doing is wrong. NYPD was asleep and its conscience was stone dead until they got a load of what was on Anthony Wiener’s laptop. It was only when these men could finally see what they were protecting, and what was actually going on, that the worm turned. Since then the “Revolt against the Revolting” has spread from the NYPD to the FBI to Treasury to DOJ to the USAG to the Inspector Generals. Good men in all these LEO organizations and in the military are rallying. Just as the Vermin have deliberately confused America with “the US”, they have deliberately confused the United Nations with “the UN” and they have used us and our churches and our lawful institutions as storefronts that they have usurped upon and tried to “eat out” from the inside, like tape worms. The only way these commercial criminals could succeed was by deceit and secrecy and by co-opting decent people. That’s why all the “Secret Societies” and “Secret Orders of Knighthood” and “Secret Fraternities”, all the payola, all the strict compartmentalization of knowledge exists—to bribe, to entice, to control, to enforce, to blackmail. Now, people are waking up. Mr. Trump and an Alliance of White Hats will clean up the Municipal United States and all the renegade alphabet soup agencies that the Enemies of Mankind intended to use as a mercenary “ARMY” already in place and operating under color of law on our shores. Trump will do this in spite of great resistance from guilty members of Congress, some members of the “Senior Executive Service” and guilty senior Agency personnel. The ax has already fallen in the “STATE OF ARKANSAS”. I predict that the next bastion of criminality to go down will be the “STATE OF NEVADA”. As the wheels of Justice begin to grind, the extent of the corruption and the horrendous nature of the corruption will be exposed. You will see how good men were drugged and tempted and lied to and then systematically forced to do hideous things by blackmailers. You will see how bad men rose to power and how they used political power and legal chicanery to undermine our lawful government, while protecting themselves from the consequences of their own criminality. If anyone from the UN CORP wants to complain about it, they will be facing a new coalition of nationalist governments. The Territorial United States has been under martial law since 1863, so that is no news at all. Recent reports that Russia is mobilizing have implied that they are doing so to attack us. Not so. They are actually sending a very stern message to the EU, especially France and Benelux and Switzerland. Russia has saved our bacon on at least three occasions, and is preparing to do so again, because a nationalist America helps preserve other nationalist governments worldwide, including the nationalist government that has developed in Russia over the past four decades. The riots you are seeing in France and Germany mark the realization of the rank and file population that they are being taxed to death for no reason, and that this is being shoved down their throats by globalist corporations and political puppets that have no loyalty to France, no loyalty to the French People, no loyalty even to common decency. Ditto the same in Germany. As these criminal corporate interests are rooted out and exposed to the light of day and the various schemes that they have used to defraud and oppress people under color of law are unraveled, a Great Awakening worldwide will come. People will finally understand what “self-government” requires of them. They will understand money and credit, too. All the snake-oil and idolatry of Babylon will be revealed and in the revealing, it will be overcome.